Continuity mistake: When Billy Connolly and his on screen brother have just been for a swim, they are drying themselves off on shore. Just to the left of his brother you can clearly see someone windsurfing in the background - not bad for the late 19th century. 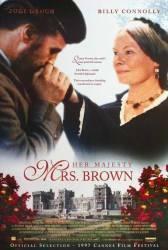 Factual error: The queen's maid tells Brown that the queen is currently reading 'Lord Tennyson.' That would be difficult in 1864, as Tennyson did not accept a peerage until the early 1880s. Factual error: Benjamin Disraeli was not Prime Minister for most of the period (1860s through the 1880s) of the film. Continuity mistake: John Brown is trying to coax Queen Victoria out of her withdrawl from life following Albert's death by enticing her to take up some gentle horse riding on her favourite steed, but she is having none of it. So he proceeds to stubbornly station himself below her bedroom window with the horse every morning despite pleas from all concerned to desist from the practice. When JB and horse are viewed from the ground he is standing on the horse's offside but when viewed from QV's bedroom window she (and we) see him standing on the horse's nearside. Continuity mistake: When Billy Connolly and Judi Dench are in the rowboat, the standard flying on the rear of the boat appears solid yellow in the long shots, but mostly dark blue with only bits of yellow in the close-ups. John Brown: We were due in at 1.15. You're late.